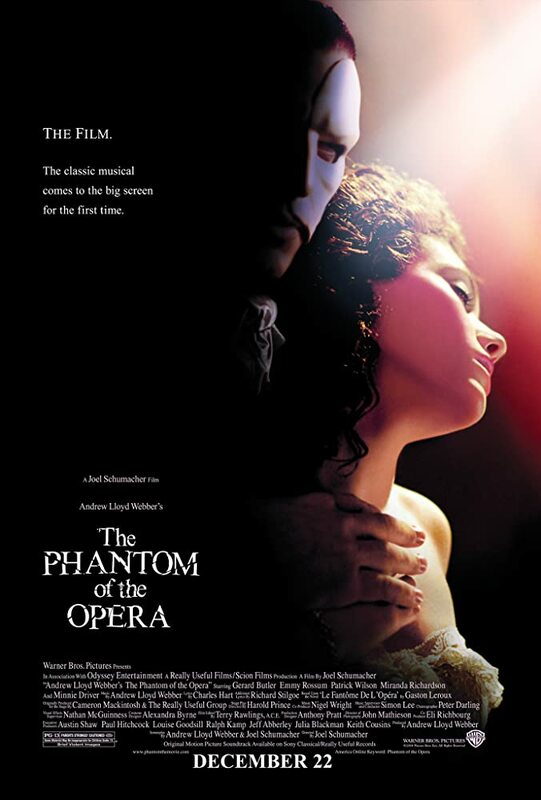 Movie: "The Phantom of the Opera"
A mysterious phantom takes a young singer under his wing and trains her, using fear to push her to the forefront of operatic stardom. 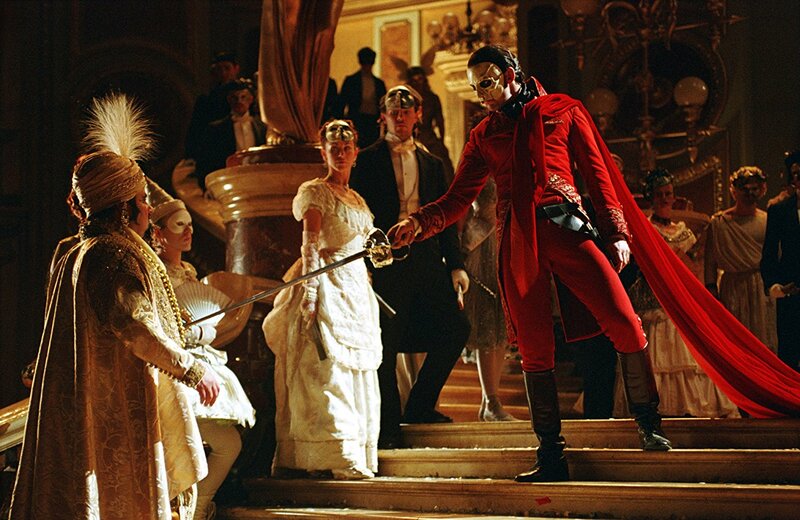 "The Phantom of the Opera" is a story that dates back to the first decade of the 20th century. Gaston Leroux's novel has been adapted and reimagined countless times, but none caught the imagination of the public quite like Andrew Lloyd Webber's 1986 musical. That adaptation has helped keep the story alive. Just shy of a century after the original publication and 18 years after Webber adapted it to a musical, writer/director Joel Schumacher brings that story to the silver screen. Schumacher is a veteran director known for such films as the teen horror "The Lost Boys," the racial-driven courtroom drama "A Time to Kill," and the incomparably campy "Batman and Robin." This film revolves around a young singer named Christine Daaé (Emmy Rossum), who is taken under the wing of and trained by a disfigured musical genius who lives in the catacombs under a Parisian opera house and haunts the building as a 'Phantom' (Gerard Butler). Christine is very talented, and the Phantom has taken a fancy to her. He believes she should be the lead singer at the opera house instead of Carlotta (Minnie Driver). The Phantom uses fear and threats of death and destruction to establish Christine at the forefront where he knows she belongs. Christine quickly becomes a star after she proves her musical talents to new theater managers Firmin (Ciarán Hinds) and André (Simon Callow). When Christine's childhood friend Raoul (Patrick Wilson) returns and garners her affections, it causes the Phantom to lash out, putting everyone in danger since he wants her all to himself. Let us say off the bat that this version of "The Phantom of the Opera" is not without its flaws. One could argue that Gerard Butler is undoubtedly miscast as the Phantom since he lacks the musical chops to really pull off the role. There is some truth to that critique, but we think he has a commanding, intense on-screen presence, and honestly, he does a decent enough job considering his total lack of singing experience. Hello, have you seen Pierce Brosnan in "Mamma Mia!"? There are also some odd directorial choices by Joel Schumacher, including an excessive, unnecessary use of slow motion and a scene where a horse appears out of nowhere. Needless to say, some artistic license was taken to dramatize the story. Truth be told, we could have used more horses. All that aside, we really, really like this film. The source material is so strong and the music is so compelling and powerful that we're able to forgive most of its other flaws (except the damn slow motion because it's truly out of place and terrible). Andrew Lloyd Webbers' songs and melodies are timeless and iconic, and we can't help but sing along with the movie every single time we watch it. It doesn't hurt that they are being sung by Emmy Rossum, who is fantastic as Christine. She has a magnificent voice and really belts out her part and gives it all she's got. Patrick Wilson is no slouch, either, and is a surprisingly good vocalist. 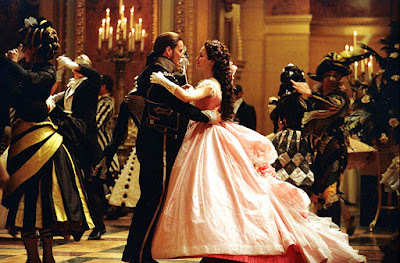 "The Phantom of the Opera" also provides elegant, sumptuous, and striking visual eye-candy given that it takes place in the 1800s. 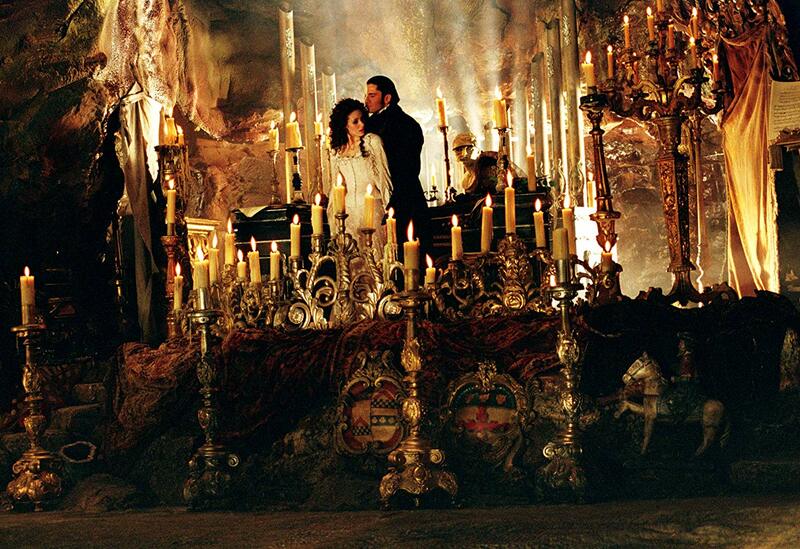 The way the Phantom's lair looks is haunting and beautiful. The opera house is grandiose and impressive. The costumes are intricate and stunning looking, as are the sets, hairstyling, and decorations. "The Phantom of the Opera" (2004) might not be a perfect film, but it is still highly enjoyable and visually pleasing. Plus, it has terrific music. What more could you ask for (besides more horses, of course)?